Achim Wennman is a Senior Researcher at the Centre on Conflict, Development and Peacebuilding (CCDP) of the Graduate Institute of International and Development Studies in Geneva, and Executive Coordinator of the Geneva Peacebuilding Platform. This article was originally a delivered at the Conflict Research Programme’s ‘Political Economy and Governance in Syria’ conference in December 2018. 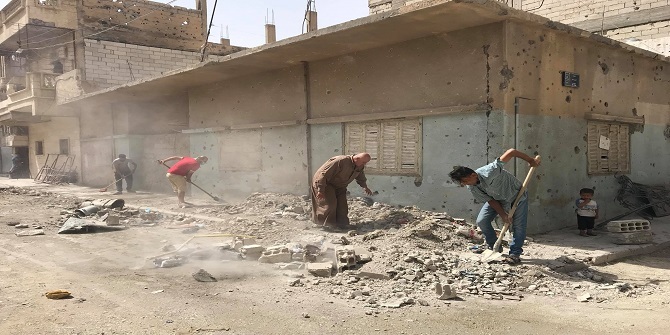 In the absence of reconstruction programmes for their destroyed city, the civilians in Raqqa begin repairing their houses and removing debris from the streets. Credit: Aboud Hamam. As the head of a peacebuilding network, I often wonder about the challenges of peacebuilding in Syria and how these will affect peacebuilding elsewhere in the Middle East and the world. To reflect on these questions, I relate to my own work on the political economy of conflict and the future of peacebuilding practices. If we look at the literature on peacebuilding over the last two decades, we can point to a strand of work that highlights the dysfunction of peacebuilding as an international project that aims to produce order, prosperity and participation all at once. The more recent writings on the ‘post-liberal’ era may even suggest that peacebuilding has become an orphan. At least one analysis predicts a decline in donor assistance to peacebuilding in Germany, Sweden, the UK, and the EU. Such analysis is also cognizant of the changing political environment that prioritises stabilisation over transformative approaches. Research carried out by scholars at Kings College London illustrates this shift from peacebuilding practices associated to civil wars to political settlement negotiations in the era of stabilisation. This changing policy environment may enable post-conflict efforts in support for stability and prosperity, but less so for peacebuilding approaches that aim to transform underlying conflict dynamics. Within the context of Syria’s political economy, these trends might also marginalise initiatives focusing on participatory politics. At best ‘participation’ may become part of a narrative around sequencing that relegates the place for inclusive politics to a later stage. If interests for Syria’s post-conflict reconstruction converge around the formula ‘order and prosperity first – participation later’ it may well be that this approach will frame post-conflict policy in other parts of the world for at least a decade. What does this changing policy environment mean for peacebuilders who have dedicated much of their work to strengthening inclusive politics? An answer may be to continue such work without explicitly calling it ‘peacebuilding’, much like the myriad of community-based initiatives in many places that build peace on a daily basis without calling it by that name. Peacebuilders may also need to reflect on their ways of working. Rather than proposing technical programming and advice to build peace, they may shift to campaigning and movement building. There are lessons learnt from the fight against dictatorships in Latin America in the 1970s and 1980s that are relevant again today. From this perspective, peacebuilders might find utility in focusing their work around the vulnerabilities of authoritarian regimes, including for instance their lack of legitimacy, their disrespect of basic norms, and the fear of their own people. With regards to the argument on legitimacy, let’s consider the experience of Rwanda. This country illustrates how a Government that lost substantial local and international legitimacy, following the 1994 genocide, put all its eggs in one basket, so to speak. The Government prioritised restructuring the economy, along a Western liberal model, so as to attract more investment and create more jobs. Business reforms were carried out while political participation was halted with hopes that economic growth would help build a degree of ‘performance legitimacy’ and strengthen the position of the President and governing party. Rwanda may be the example that some observers point to when looking for evidence of the formula ‘order and prosperity first – participation later’. Adopting this trajectory to Syria may offer novel perspectives on Syria’s peacebuilding challenges. First, the Government and ‘warlords’ may realise that the preservation of power will become more difficult once the war is over. In part this is due to the sheer necessity to deliver vital services (such as education, jobs, transportation, etc.) but also due to the operational challenge to deliver them, including the needed institutional capacity, human resources, and budgetary resources. If the war is over, the population will judge the Government or ‘warlords’ based on their ability to deliver and perform which in consequence builds legitimacy. Yet, it also means that the war can no longer be used as an excuse for things not working or not happening. How good the Rwanda scenario may sound, it is a scenario difficult to imagine in Syria’s current state of affairs. The Government or ‘warlords’ have little incentive to develop and commit to a formal political resolution to the war. Hence, the second peacebuilding challenge, which can also be described as a ‘no war no peace’ scenario for Syria in the coming years. This scenario offers enough flexibility to advance lots of ‘reconciliation’ realities that have their own local logics, interests and particularities. It may also open tactical spaces for the Government to regain control of territory and control access to economic spaces or over economic flows (especially remittances and investment). Especially the latter will become more important as the Government needs to expand budgets to pay for reconstruction and service delivery, while remaining relatively isolated internationally. This leads me to a third peacebuilding challenge: How will Syria’s Government shape the balance that guarantees them stability and control over key economic sectors while at the same time creating opportunities to satisfy and co-opt an increasing amount of people that are currently outside of its support systems. From this perspective, expanding the layer of popular legitimacy (by for instance delivering essential services and expanding economic opportunities) is an extension of the Government’s core interest in ‘regime security’ because it can mitigate discontent. Yet, shaping this balance in favour of the Government will be difficult in the face of Syria’s ‘closed-access’ or ‘monopolised’ economy with limited prospect for expansion. From this perspective, two sources of tension need management; on the one hand the interests within the authorities’ own ranks in the persistence of monopoly- and rent-based systems, and on the other hand, the interests of actors outside its system in essential services, economic opportunities, and perhaps also, political participation. The processes behind the evolution of a new balance – and the management of the moments of ‘re-balancing’ – could shape a new vision for ‘normal’ politics to take its course again. Such politics have checks and balances, get things done, and creates spaces for people to move on. After nearly eight years of war, there is undoubtedly a peace to build in Syria but there are many open questions about the ‘what’, ‘how’, ‘who’, and ‘when’ of peacebuilding in Syria. Totally agree that peacebuilders need to shift tactics – and include more campaigning and movement building. That’s why some 16 peacebuilding organisations have formed a coalition. Our first, small action was to get peacebuilding into the dictionaries – and we plan to build from here.